Hostiso is a privately held web hosting company, based in Germany. It started in 2007, by now they have customers from over 150 countries, with data centers in the U.S., Canada, Germany, France and Singapore. In 2015, the year they managed to cover all word regions with the new Singapore data center, they started to accept Bitcoin payments. By now Hostiso proudly hosts 50.000 domains. Hostiso offers you E-Commerce ready soulitons, start selling products on your website using openCart, PrestaShop, Magento, ZenCart. All plans include free SSL certificates, complementary DDoS protection, free migration, free cPanel and backups (for the managed plans). You can choose managed VPS services from 2 cores, with 2 GB RAM, 100 GB SSD storage and 2 TB bandwidth for $25/month, to 12 cores, with 32 GB RAM, 2000 GB SSD storage and 30 TB bandwidth for $119/month. The unmanaged plans goes from 2 cores, with 6 GB RAM, 500 GB HDD storage for $14,99/month, to 10 cores, with 50 GB RAM, 1200 GB SSD storage for $69,99/month. They also offer a 60 day money back guarantee if you are not satisfied. If you need more performance on your server you can upgrade without any downtime at any time. You can choose from Hostiso’s 3 shared hosting plans, which all come with free daily, weekly and monthly backups, free domains and SSL, unlimited bandwidth and 60 days money back guarantee. For $6,99/month you get 100 GB SSD storage, 512 MB DDR4 RAM, 512 MHz CPU, 3 hosted domains and 10 email accounts. The Business Plan comes with 500 GB SSD storage, 1 GB DDR4 RAM, 1 GHz CPU, unlimited hosted domains and email accounts, for $9,99/month. For $14,99/month, with the Pro Plan you get unlimited SSD storage, 1,5 GB DDR4 RAM, 1,5 GHz CPU, unlimited hosted domains and email accounts. With Hostiso you can host your website on a high-class dedicated machine set up and managed by their best experts. In addition they provide a lot of highly innovative proprietary software to boost your server performance. The servers are fully managed with cPanel and apps installer. For $149,99/month you get 16 GB RAM, Intel i7 or E3 CPU, 1 TB HDD space, 10 TB bandwidth. You get 16 GB DDR4 RAM, Intel® Xeon® E3-1270 v5 CPU, 2 x 2 TB RAID 1 storage, 10 TB bandwidth for a bit more, for $199,99/month. The top plan comes with 32 GB DDR4 RAM, Intel® Xeon® E5-1650 v2 CPU, 480 GB SSD storage, 20 TB bandwidth for $219,99/month. From this year Hostiso also offers great reseller options, for those who wish to resell their services. The plans comes with WHM reseller controll panel, RAID10 SSD storage and free SSL for all accounts. You can choose the basic option with 50 GB storage, 1 TB transfer, 50 cPanel accounts, 2 free domains for $25/month, or the business plan with 150 GB storage, 5 TB transfer, 100 cPanel accounts, 7 free domains for $45/month. The top, Pro plan comes with 300 GB storage, unlimited transfer, 150 cPanel accounts, 10 free domains for $60/month. Hostiso guaranties you 99,99% uptime, with great support, via live chat, ticket or e-mail. With their 5 big data centers, they achieved really good geographic coverage. You can get your plan in the U.S., in Canada, France, Germany and Singapore. They received really good user reviews, mostly for their good prices and premium support. 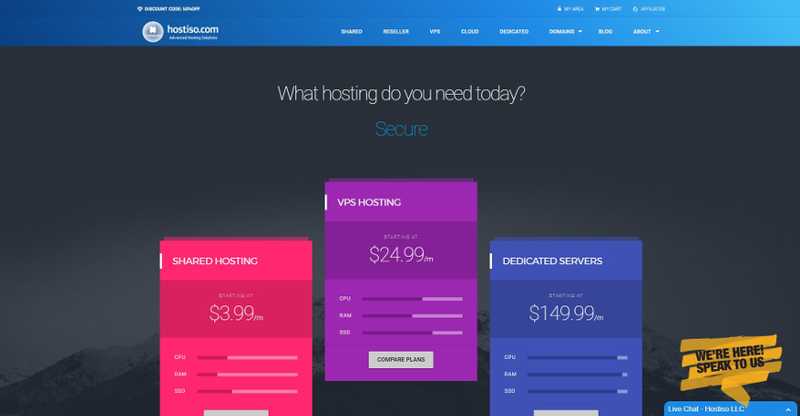 In this Hostiso review we found that they offer hosting in a wide area, with 99.99% uptime guarantee and a 60 day money back guarantee. On the negative side they only have 5 plans to choose from, but they are on a great price. We are participating in Hostiso’s affiliate program, but that does not affect any ranking or facts. We always give our own, honest opinion in our Hostiso review. there are managed options at the unmanaged plans as well, don’t get confused!